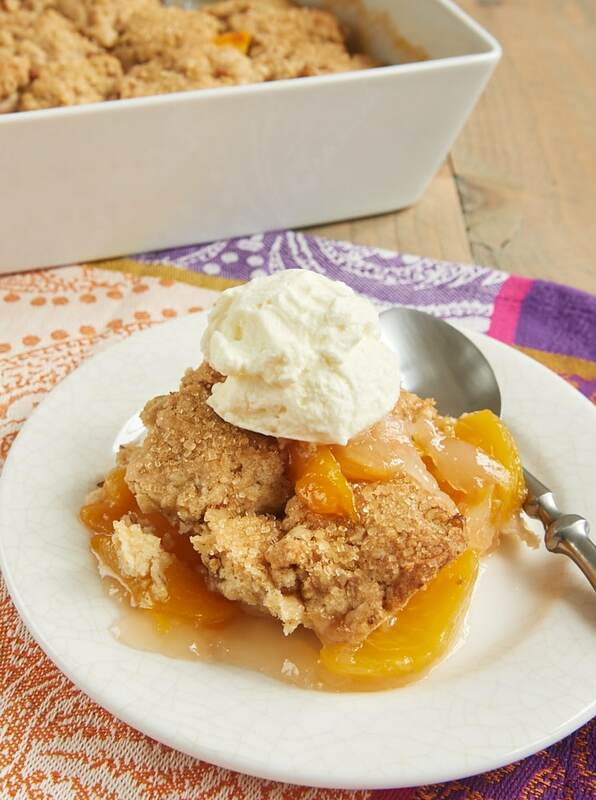 Peach Cobbler is such a Southern dessert staple. There’s no telling how many servings of it I had in all the years I lived in Mississippi. So many summer meals ended with a serving of it alongside some vanilla ice cream. It’s certainly less prevalent in New York, so I just make my own when the craving strikes! 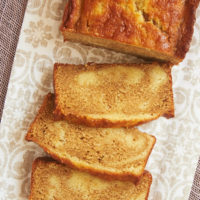 For a little twist on the traditional, this recipe features one of my favorite flavors – ginger! I have become completely enamored with ginger sometime in the last few years. We use it often in cooking, but I also love the hint of spicy flavor it adds to desserts. I just couldn’t resist adding a bit to some sweet peaches! When I bake with a blend of spices (like Chai Spice Bundt Cake or Spiced White Chocolate Blondies), I don’t hesitate to use ground ginger. But for this recipe, I recommend using fresh ginger for the best flavor. Ground ginger just doesn’t give you quite the same taste. Luckily, fresh ginger is usually easy to find and relatively inexpensive. And you can store it for quite a while in the freezer. Just take it out and grate what you need! I’m also a big, big fan of this cobbler’s topping. 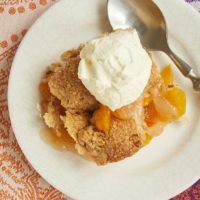 I first used a brown sugar biscuit topping on a cobbler with another favorite, Brown Sugar Apple Cobbler. 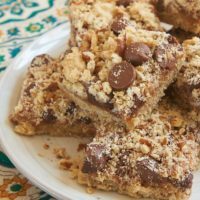 Changing the regular sugar to brown sugar makes such a big difference! The flavor is the perfect complement to the sweet, slightly spicy filling. 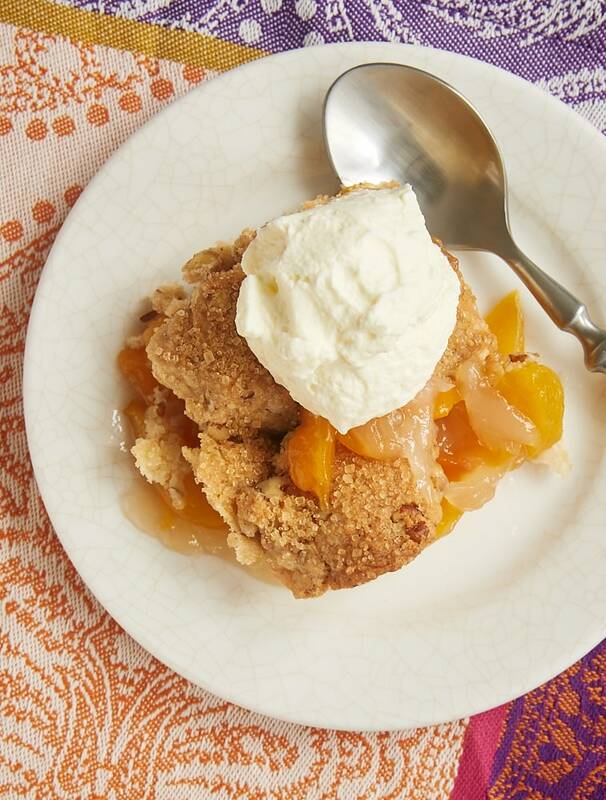 I must say that of all the Peach Cobbler variations I’ve tasted, this one is my favorite. The flavor is just amazing! My favorite way to serve it is warm with some sweetened whipped cream. But whether you eat it that way, at room temperature, with ice cream, or straight out of the refrigerator, it’s all good! 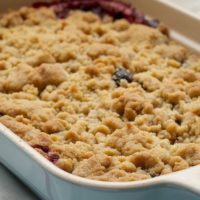 Find more delicious cobblers, crips, and crumbles in the Recipe Index! 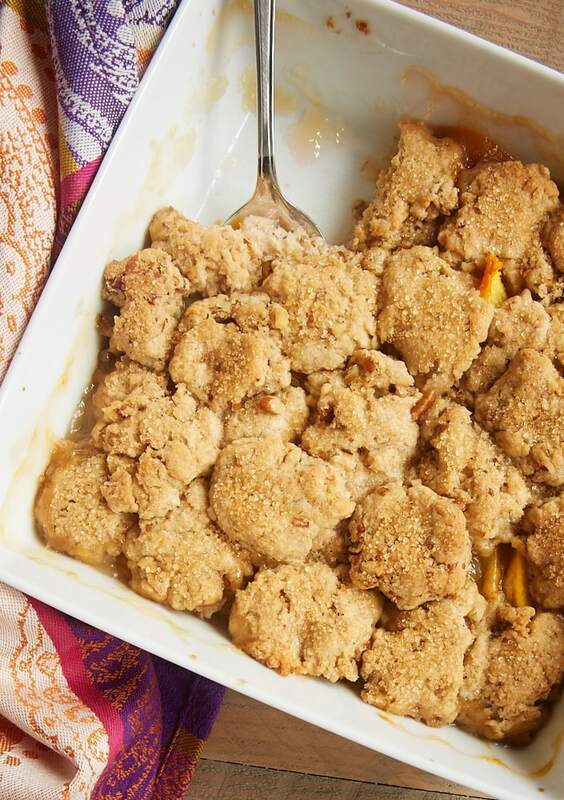 Ginger adds a bit of spice, and pecans contribute some crunch to this fantastic Ginger Pecan Peach Cobbler. Combine the peaches, sugar, lemon juice, cornstarch, and ginger in a large bowl. Set aside while you make the topping. Combine the flour, brown sugar, baking powder, and salt. Add the butter, and mix with a pastry blender, a fork, or your fingers until the largest pieces of butter are about the size of large peas. Add the milk, about a tablespoon at a time, mixing just until the mixture forms crumbs. Gently mix in the pecans. Transfer the peach mixture to a 2-quart baking dish. Drop the topping by tablespoonfuls over the peach mixture. Sprinkle with turbinado sugar or sanding sugar. Place the baking dish on a lined, rimmed baking sheet to catch any spills. Bake 40 to 45 minutes, or until the topping is lightly browned and the filling is bubbly. Serve warm or at room temperature with ice cream or sweetened whipped cream. *Feel free to adjust the amount of ginger to your taste. This amount gives the cobbler a nice flavor but isn’t too bold. This looks amazing. I like the ginger and peaches together. My mom used to serve cold sliced peaches with hot gingerbread. Nothing better. I have to make this. Thanks for sharing. I’d love it if you brought this to What’d You Do This Weekend. Oh, that sounds amazing, Jennifer. I recently made some peach ginger ice cream – so good! I’ll have to try this. This was amazing (as is everything else I’ve made from your site)! Perfect mix of peaches and fresh ginger. Since there are only two of us at home, I cut the recipe in half and it worked fine. Just enough for two days worth of dessert. Next to try – Berry Vanilla Cake. WOW, it sounds so good! I’m so glad you liked it, Jackie! I hope you enjoy the cobbler, Courtney! 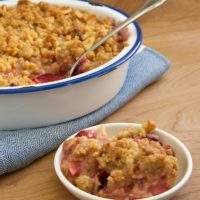 Can I substitute frozen peaches in this recipe? I’ve not tried using frozen peaches, but I’d guess it would be fine. Have some fresh apricots and will use them instead ! Thank you so much for this idea ! 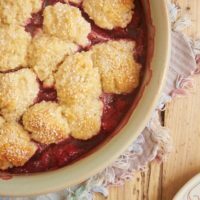 How would the recipe need to be adjusted if canned peaches are used instead of fresh peaches? Hi, Hillary. Canned peaches are usually sweeter and have a good bit of liquid added. You’d need the same volume of peaches as listed, but I would probably drain them very well and reduce the sugar to taste.